Bathroom Plumbing | Brooks Plumbing Co.
What Can Cause Your Toilet to Overflow? It goes without saying that no homeowner ever wants to deal with an overflowing toilet. Not only is this very often a messy issue, it is inconvenient and can even be costly should the water travel to other rooms in your home. In most cases, you can either solve this problem with a plunger to remove an offending clog, or by calling a professional plumber. However, knowing what the common causes of overflowing toilets is can help you too, as you may be able to avoid running into this problem again in the future. No matter what the cause, it’s vital that you call a professional plumber to get to the root of the problem. Posted in Plumbing | Comments Off on What Can Cause Your Toilet to Overflow? If you’ve been looking for ways to save water in your Olympia, WA, home, we may have a very easy solution for you: consider the installation of a low-flow toilet. Why? It all comes down to water usage, and if you have a toilet or toilets that aren’t low-flow, then these toilets comprise over 25% of your home’s total water usage. Putting this another way, if you have a toilet that is a 5 or 7 gallon toilet, and you average 5 flushes a day, your toilet uses between 9,000-12,000 gallons of water per year. Low-flow toilets use a maximum of 1.6 gallons, cutting this amount down to just over 2,900 gallons of water per year – an amount 3-4 times less that of 5-6 gallon toilets. How do low-flow toilets manage this? First, they have some simple yet key design differences from higher-flow toilets, starting with the bowl outlet hole. In a regular toilet bowl, the outlet hole is located toward the back of the bowl; in a low-flow toilet, the outlet hole is located in the center of the bowl so that waste can more easily and directly exit the bowl. Another modification that you’ll find with a low-flow toilet is that the balance of the water in the bowl is toward the front of the bowl; this helps move waste quickly and effectively. The last difference you’ll find between a low-flow toilet and a regular one is that the flush valve is larger. Having a larger flush valve creates a stronger flush, which helps push waste out of the bowl and into the outlet pipe. Interested to see what a low-flow toilet can do for your home? Call the plumbing experts at Brooks Plumbing today! People choose to remodel a bathroom for many different reasons. While some homeowners just want a new look and feel to the room, others remodel for practical purposes, making fixtures and storage space more accessible or installing money-saving appliances. Others remodel to take advantage of upgrades that will make their bathtubs or showers seem more relaxing and luxurious. Regardless of your reasons for upgrading, you should remember to work with a trained plumber every time you make major changes to the room. Bathroom remodeling usually involves some level of plumbing work, and, no matter how small it may seem, it takes a professional to determine the proper placement and sealing of your new fixture and to decide if any pipe reconfigurations must be made. You may decide, for example, to install a new pedestal sink, which involves reposition the pipes so that they are fairly hidden from view. Or, you may choose to switch to a single handle design over a separate hot and cold lever for the sink, another decision which involves some plumbing knowledge for installation. Another plumbing item you might consider is a low-flow toilet. If your toilet is more than a couple decades old, it probably uses more water than it needs to for a single flush. Modern low-flow toilets use only half of the water needed for flushing of older toilets because they rely on a lot of pressure to get the job done instead of high volumes of water. Some toilets also have dual flush options for liquids and solids, and the single flush setting uses even less water per flush. Installing a toilet is a big job, requiring careful sealing and knowledge of valves as well as a bit of strength to pry the old toilet out. Finally, if you’ve decided on a new bathtub, be sure to have a plumber work with you throughout the process so that you can get the right size and shape for your bathroom remodeling project. A plumber may need to reinforce the floors, reconnect drain pipes, and hook up the new tub to the main water supply, all while checking that the new installation is in compliance with local building codes. The friendly people at Brooks Plumbing can work with you on your Olympia bathroom remodeling project and help everything to go as smoothly as possible. Give us a call! Ah, your bathroom. It can be an oasis from a long day (think long baths) or a trip to Hades if you’ve got plumbing problems. The good thing is that many bathroom plumbing repairs can be resolved rather quickly, and even if they can’t, you’ve got the experts on hand who can help you day or night: Brooks Plumbing. Drain clogs are very common in bathrooms because they see a lot of use and also have to deal with two tough challenges every day: soap scum and human hair. Soap has fat in it, and when the excess soap lather heads down the drain, the soap scum clings to the piping and can harden. Combine this with hair, and you’ve got a nice clog on your hands. No one really wants to think about their toilet in any kind of detail, but it is a very used item in your home and can develop problems. One of the most common problems with toilets is running. With a running toilet, the water is constantly in flow; you’ll likely hear a noise coming from the tank. The main reason toilets run is because the flush valve isn’t closing all the ways, so water from the tank keep running into the toilet’s bowl. Other common toilet problems can be clogs and slow tank fill. Slow draining sinks are usually the harbinger of clogs to come, so if you are experiencing a slow draining sink, try to resolve the issue before it becomes a full-on clog. Slow draining sinks can be caused by objects lodged in the piping, soap scum, hair, etc. You can try to clean build-up yourself with some white vinegar and baking soda, but if this doesn’t work, call a professional. Don’t let your plumbing problems stop you from using your bathroom. If you are experiencing plumbing problems in your bathroom, call Brooks Plumbing to schedule bathroom plumbing service in Olympia today! When it comes time to update the fixtures in your bathroom for a remodel or only as smaller project, one of the top items on your list of “must-haves” should be low-flow faucets, shower heads, and/or toilets. You can create a gleaming, more attractive look for your bathroom and at the same time contribute to water-conservation that will reduce your water costs significantly. The planet will thank you as well! Installing new bathroom plumbing in Olympia, WA is one of our specialties here at Brooks Plumbing. Especially when it comes to low-flow toilet installation, you need to leave the work to professionals who will make certain that your new fixtures provide the savings you want and do their job effectively. You’re probably curious about how much a low-flow faucet actually will save you, and if it will still provide the level of performance you need. According to U.S. EPA tests on WaterSense labeled faucets, they lower the water flow by 30% or more, dropping from 2.2 gallons per minute to 1.5 gallons per minute—and without impairing performance. With this reduction, an average family would save 700 gallons of water each year, which is the equivalent to 40 showers. Look at your current water bill and multiple the cost per gallon by 700… that will give you an idea of the savings potential. Low-flow fixtures will also save you energy, since they place less power demand on your water heater. Toilets are the principle source of indoor water use, accounting for a third of the water consumed in an average household. If you have an older toilet, it’s probably draining 6 gallons per flush, which is an immense waste compared to the efficiency of a low-flow model. EPA-approved low-flow toilets use 1.28 gallons per flush, a huge improvement over old models and still 20% better than the current regular flow toilets that use 1.6 gallons per flush. Depending on the age of the toiler you’re replacing, a new low-flow model can save you 20–60% a year—almost 13,000 gallons. And, like the low-flow faucets, there’s no sacrifice in performance. Although low-flow fixtures for your bathroom do cost more than standard models, keep in mind not only the savings but also the lifespan; these new installations should last you for many years and pay for themselves many times over. Regardless of the reason that you decide to install new water fixtures in your bathroom plumbing in Olympia, WA, low-flow models are a terrific way to reduce your yearly bills and contribute to country-wide water conservation. Call Brooks Plumbing today and talk to our experts in bathroom plumbing to find out more about how we can make your bathroom more beautiful and budget-friendly. When people think of adding a new sink for their bathroom remodel, they often consider two basic kinds of modern sinks: the under-mount/top-mount model (a sink set down into the surface of a cabinet and mounted the counter with clips from underneath) and the drop-in model (similar to an under-mount, except a lip around the edge supports it from falling through the hole). However, there are some interesting style options available that can enhance your bathroom plumbing in Olympia, WA during a remodel. For any level of bathroom remodeling you are looking for, from replacing the sink to a complete re-do of all the fixtures, you can find the service you need at Brooks Plumbing. We carry many types of fixtures and furnishings so you can design your new bathroom the way you want. These sinks attach directly to the wall and extend outward like a ledge. The plumbing underneath is exposed, although designed to look unobtrusive and fit in with the rest of the décor. Wall mount sinks give an immense feeling of space to a bathroom, and what they may lose in cabinet storage, they make up for in additional floor space and forward-looking modern design beauty. If you would prefer to have vintage charm to your bathroom rather than the sleek modern style of a wall-mount sink, then a pedestal sink is a great choice. (There are modern-looking designs as well.) Pedestal sinks take up less room than most other sinks, so if you are designing a small bathroom or wish to save space for another appliance, a pedestal sink is one of the best options available. A vessel sink creates an interesting optical illusion for a bathroom: it looks like a large, independent bowl set on a table underneath a faucet attached to the wall. However, the bowl is set into the table, with plumbing underneath. Vessel sinks look extremely attractive and stand out as a feature in the bathroom, and this is a case where the material you choose for the sink will have an enormous effect on the appearance of the bathroom. They are distinctive and also simple to install. Each type of sink, whether the three above or the more traditional drop-in and under-mount models, have disadvantages, and choosing one depends on the design scheme of the bathroom, your requirements for space, and the amount of maintenance and upkeep you’re prepared to do. However, speaking with an experienced bathroom remodeler will help you make the best choice to elevate your old bathroom into something beautiful, spacious, and relaxing. Call Brooks Plumbing to talk to our remodeling specialists and learn how we can help your bathroom design and bathroom plumbing in Olympia, WA. Trouble in the bathroom? As one of the most utilized rooms in the house, your bathroom endures a lot of wear and tear on a daily basis. Its primary system is that of plumbing: shower fixtures, bathroom sink vanity faucets, and, of course, the toilet, among others. You need your bathroom to operate smoothly in order to preserve the hygiene of your family members and your home. The bathroom can also be a place for relaxation, if you have a nice bathtub. But with all that wear and tear comes the need for repair. There are some common issues with bathroom plumbing that may turn up at your home sooner or later. Call Brooks Plumbing today when you need an Olympia, WA bathroom plumber. Shower drain clog. Because of the amount of soap, hair and gray water that goes down your shower drain at such a rapid and continuous rate, there may come a time when you have a clog that needs dislodging. If it’s persistent, it’s best to have a professional try to remove the accumulation rather than approach it yourself. Using an auger improperly can damage your plumbing; a plumber can also make sure that the job is completed thoroughly. Vanity trap issue. Your bathroom sink vanity has a U-shaped bend underneath the drain, just like any other component of your plumbing system. But if you have a slow drain, or if an accumulation becomes lodged within the trap, you may have to call for a professional plumber to remove the blockage. Toilet won’t stop running. The toilet is often the largest consumer of water in the home, although today’s low-flush models have cut this consumption in half. Nevertheless, if your toilet won’t stop running, this can mean a higher utility bill every month because of all the wasted water. There may be a problem with the flush valve. Showerhead leaking. This could be a problem with the threads onto which your shower fixture screws, but it could be a problem with the shower water valve itself. 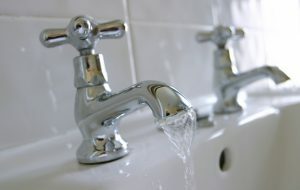 Make sure that you have any of your bathroom plumbing problems taken care of by a professional. Call Brooks Plumbing today to speak with an Olympia, WA bathroom plumber. If your showerhead or other plumbing fixtures suddenly have reduced water flow, call the Olympia plumbing experts at Brooks Plumbing to take a look at your showerhead and provide the right solutions. When reduced water flow occurs throughout a home, it can indicate that a serious plumbing problem has sprung up which needs to be addressed quickly. However, if water pressure remains normal throughout your home, and there’s only reduced water pressure in the showerhead itself, it is usually due to one of a few simple causes. The two main causes are lime-scale build-up or a clogged water screen. Lime-Scale Build-Up: There could be an accumulation of lime-scale, which is actually calcium, a by-product of hard water. Vinegar is a simple cleaning substance that can take care of most blockages due to calcium build-up. Specific calcium cleaning agents can also be purchased at the store, but avoid using harsh chemicals, as they can damage the showerhead. Clogged Water Screen: There could also be a build-up of gravel or other substances in the water screen within the faucet head. In this instance the showerhead would need to be removed. The screen should be able to be cleaned and all debris removed so that water flows freely once again, but if the screen is no longer usable even after cleaning, it may be time to replace the screen or for a showerhead replacement. Showerhead Pipe Problems: If cleaning off calcium build-up and removing clogs from the water screen to not help the low pressure problem, there is likely something wrong with the pipes leading to the showerhead. In this case, call an experienced plumber to properly diagnose and resolve the problem. Brooks Plumbing has a team of experienced Olympia plumbing professionals who can help you out with a wide range of low water flow problems. We also find the best solution to resolve the issue. Contact Brooks Plumbing today! An overflowing toilet is a really unpleasant problem, and one you will undoubtedly want to correct right away. Toilets are reliable in that they tend to last a long time and not act up much, but when yours does start to malfunction, you pay attention right away. To start with, examine the root cause of the overflow problem. There are three major causes of overflow: a clogged or blocked drain that does not allow your Lacey toilet to flush properly, an improperly adjusted float that allows the tank to overfill and a blocked vent pipe that replaces the air in the pipe after each flush. Each of these requires a different course of action, so let’s discuss each individually. If the drain is blocked, you will probably know right away. For one, water will overflow from the toilet’s bowl rather than the tank. For another, there will probably be quite a mess. Treating this type of overflow problem is straightforward—remove the clog. For simple clogs, a plunger and some elbow grease will get it done. Another trick is to stick the open mouth of an empty two liter bottle into the drain and squeeze. The blast of air can knock the clog free. If your toilet is clogging and overflowing frequently, however, the problem may not be with the drain or with anything you are doing. It may be that the vent pipe is clogged. A vent pipe moves external into the plumbing system to replace the air that is pumped out with each flush. When it is blocked, the toilet can’t flush properly, which can lead to overflowing. If you have trouble with frequent clogging, call a plumber to inspect the situation. In both of those situations, the toilet bowl will overflow. Another possibility is that the tank overflows, which is a different kind of problem. This is often cause by the filler float being set too high, so the tank fills with too much water. You can fix this by simply adjusting the mechanism inside the tank that controls the level of the float. Whether it’s one of these three, or something else entirely, when your toilet overflows, be sure to check it out and get it fixed right away. Call Brooks Plumbing for any plumbing repairs in the Lacey area!